Tramontane Wines was set up in 2008 by Philippe Gard and Andy Cook. Our goal was to distribute a range of top quality wines from the Roussillon, in South West France. This exceptional region has a warm, dry climate perfect for healthy grapes, and a great choice of native varieties. With the domains we own and manage, plus grapes and wines bought from friends and colleagues, we are convinced that we offer exceptional and characterful wines at good prices. AOP Banyuls and Collioure Red and White. AOP Côtes du Roussillon Red, White and Rosé. IGP Côtes Catalanes Varietal Wines (Grenache, Carignan, Macabeu, Muscat Sec for example). Philippe is trained as an agricultural engineer and winemaker, and has consulted for many top Bordeaux Châteaux, and elsewhere in the world. He owns Domaine Coume del Mas in Banyuls, and lives there with his wife Natalie and their three girls. Andy trained as a winemaker in New Zealand, and has worked buying, selling, judging and promoting wine and whisky for 20 years. He lives in the Roussillon with his wife Kirsten and their two sons. Mas Cristine. Côtes du Roussillon, Muscat de Rivesaltes, Rivesaltes Ambré. Coume del Mas. Collioure and Banyuls. Consolation. Varietal microcuvées made in exceptional years. Terrimbo. 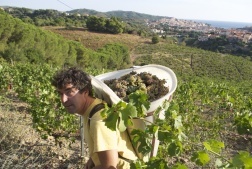 Collioure wines in organic conversion. Vial-Magnères. A range of traditional Banyuls, Rancio and Collioure. We now supply wine to over 20 countries in the world working with a wide range of customers from dedicated specialists to national monopolies. Tramontane Wines also provides personalisation of wine labels and creation of special blends for a range of customers across the world. Please contact us if this is of interest.